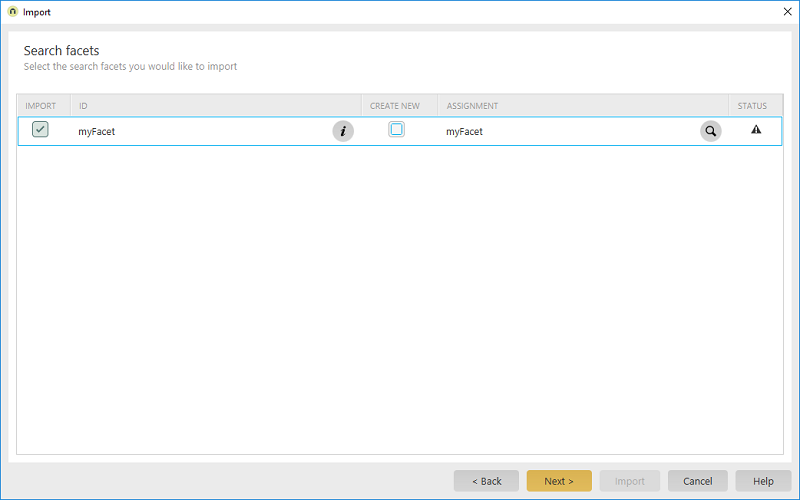 Import Import / Select an application that contains at least one search facet / Click on "Next"
This dialog is used for assigning search facets that are contained in the exported application. Activate the checkbox if the respective search facet should be imported. Displays the ID of the facet. When you move the mouse over the ID, a quicktip will tell you which application the facet comes from. Opens a dialog where the facet ID and text can be edited. With this setting, the facet will be created as a new facet in the target portal. Displays the facet ID, which the imported facet is assigned to, in the target portal. If two facets have the same ID but different language-dependent titles, then a warning is shown here. The user can decide whether they want to edit the ID of the imported facet or whether the titles from the existing facet should be applied.